When Atlanta-based lighting solutions powerhouse Acuity Brands made plans for the company’s new Engineering and Technology Center, they were hoping to create a cutting-edge work environment to drive innovation and technological advances for years to come. 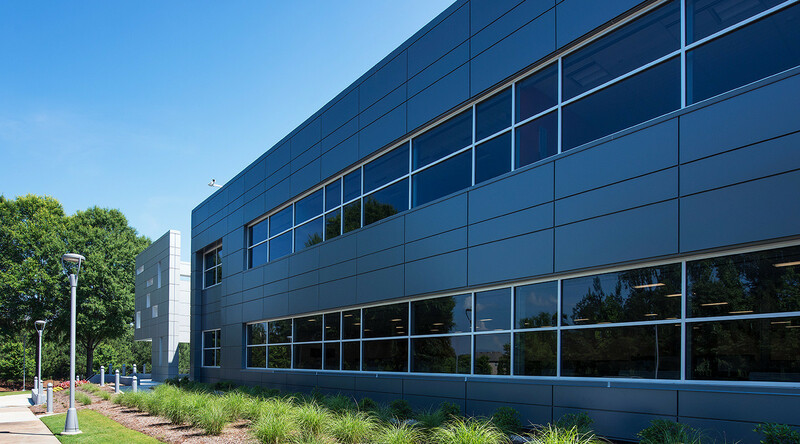 It’s no surprise they turned to CENTRIA’s Intercept system to revitalize the facility’s tired brick façade, part of a total transformation that incorporated leading workplace design, technology, and systems. The existing facility relied on an insulated stud wall with sheathing and jumbo brick exterior. The new design concept called for a sleek metal building envelope. “The Acuity executive management team challenged me to create a truly world-class facility that would provide a new, dynamic work environment and change the exterior appearance of the dated facility,” says Robb Allen, founder/president of Clear Stream Studio, LLC. As the design architect, Allen was responsible for all facility programming, architecture, landscaping, interior design and furnishing, working closely with the architectural firm of record, Homer Lewis & Associates, Inc., from inception through occupancy. Acuity Brands’ Jimmy Suttles, director of facilities engineering, cited price, aesthetics and efficient delivery time as the key factors behind the decision to use CENTRIA’s Intercept system. The simplicity of the Intercept system made it the perfect fit. The product’s quick lead time and installation combined to create an extremely efficient reclad for the fast-track project, covering more façade in less time. Intercept also requires minimal field prep and functions with nearly any substrate. 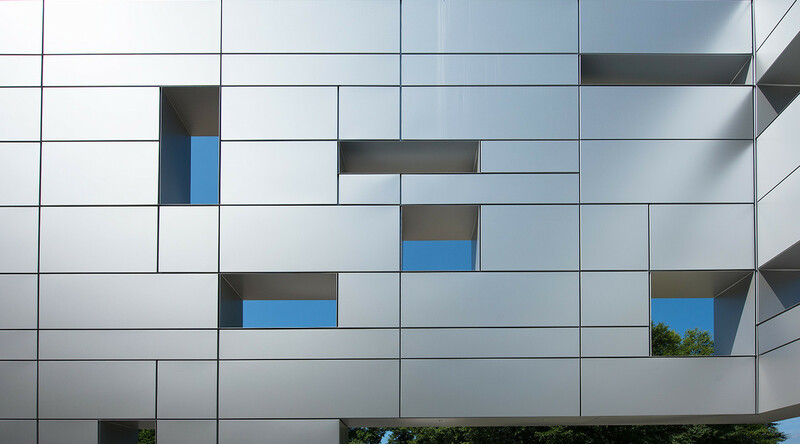 The focal point of the project is a striking design concept at the main entrance that Allen calls the “New Light Portal.” This double-sided structure utilized Intercept panels to reconfigure the exterior geometry of the existing building. The design creates a “critical interplay of lighting effects by introducing daylighting patterns through the openings and edges of the structure”—not to mention full-color illumination during night. When construction wrapped up in March, 2015, the end result was a sleek, modern aesthetic that reflects the cutting-edge ethos of the client: Acuity Brands. 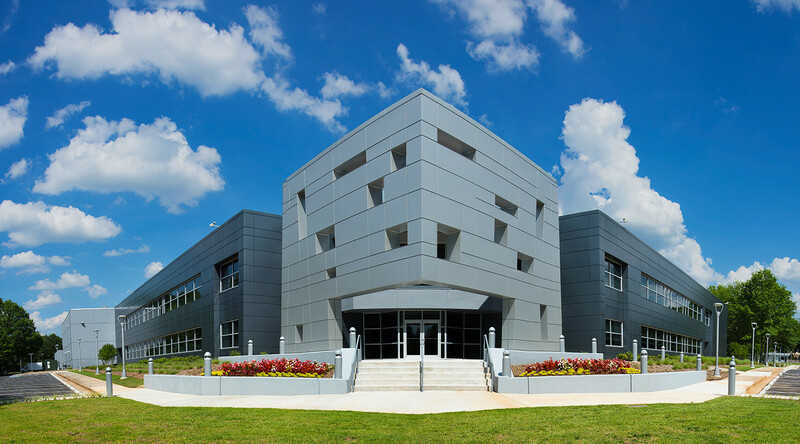 “The client was thrilled with the finished product,” reported Brian Lanier, Project Manager with the architect of record, Homer Lewis & Associates, Inc.
Intercept modular metal panels are helping the architectural community change the face of its buildings. The innovative system brings a modern flair to proven, stalwart craftsmanship derived from CENTRIA’s longstanding reputation and success in the metal panel market. The Intercept system makes use of a unique fabrication process for variations in size and shape, and even custom designs based on specific project requirements. 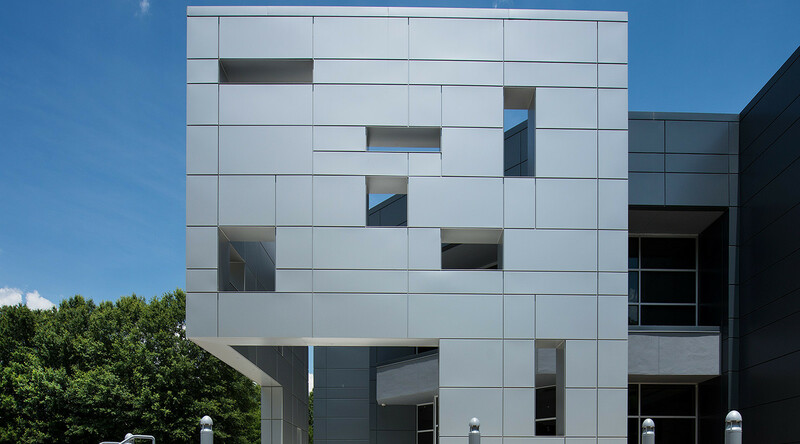 The light-gauge, monolithic aluminum sheets offer an economical solution for complex panel applications. 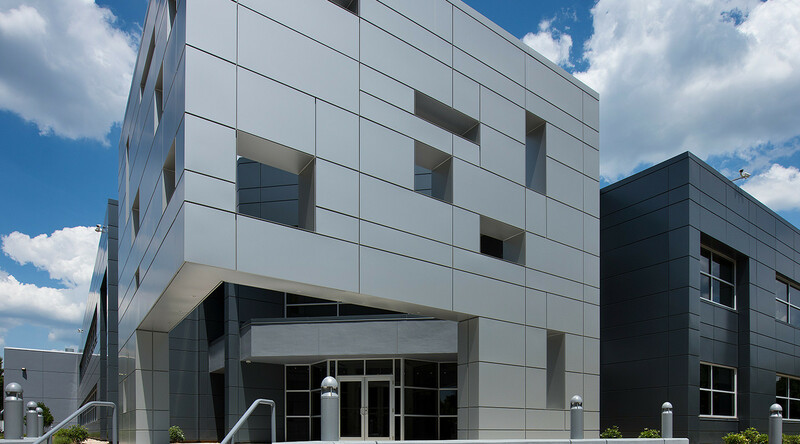 Incorporating folded sides with a wide variety of product options, the Intercept system can be applied as a rainscreen on exterior wall applications. Panels can be configured for custom depth (Intercept LVLZ) for exceptional wall relief, formed corners, wing walls, soffits, and radial wall sections without the need for exposed fasteners. 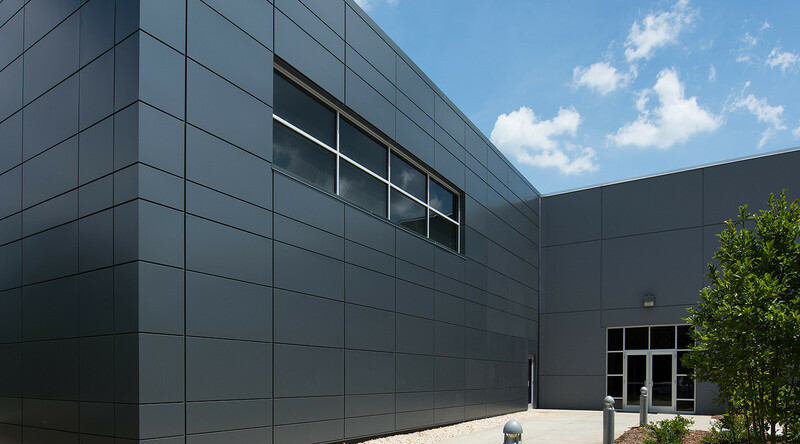 Intercept panels also integrate with CENTRIA’s MetalWrap insulated composite backup panels for a complete wall system. Like all CENTRIA products, Intercept panels were designed with sustainability in mind. The modules are tailored for architects seeking a flat panel that is nearly 100% recyclable and includes no flammable components. With a unique combination of expert engineers and the latest fabrication technology, CENTRIA’s Intercept system ushers in a new era in product manufacturing capabilities. The result is mass customization and an economical solution for complex panel applications. CENTRIA’s comprehensive role in production is key to perfecting customizable panels systems like Intercept, providing unmatched value and service. Homer Lewis & Associates, Inc.